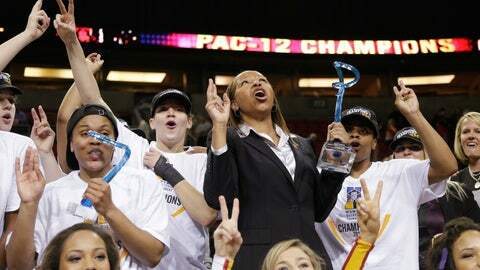 USC head coach Cynthia Cooper, center, holds the championship trophy as Ariya Crook, left, holds her MVP trophy as they stand with the team on an award podium after beating Oregon State to win the Pac-12 NCAA college championship basketball game Sunday, March 9, 2014, in Seattle. SEATTLE (AP) — When Cassie Harberts took a second to reflect, she remembered watching the NCAA tournament selection show and waiting for Southern California to appear on the screen. It was always a disappointing experience. This time, it should be a lot of fun. Kiki Alofaituli scored 12 of her 15 points in the second half, and Southern California earned its first Pac-12 Conference tournament title by rallying for a 71-62 win over Oregon State on Sunday night. "This time we can sit and be proud of what we’ve accomplished," Harberts said. "We’ve rightfully earned a spot in the NCAA tournament." Ariya Crook had 16 points as the Trojans claimed their first Pac-12 title since winning the regular-season crown in 1994. USC (22-12) trailed 34-23 late in the first half and 36-29 at halftime, but used a press defense to quickly make up the deficit in the second half. Southern California was already the first team in tournament history to win three games just to reach the final. It capped its four-wins-in-four-days streak with a defensive effort in the second half that flustered the Beavers and took away any doubt about its NCAA tournament status. The margin of victory was the largest of the tournament for USC after getting to the final with three wins by a combined 11 points. "We talked about earning this championship and they responded," first-year coach Cynthia Cooper said. "They stepped up to the plate. They responded against Stanford, they responded against (Arizona State). They responded against Arizona. There was no doubt in my mind they had it in them." USC was making its second appearance in the title game, losing to Stanford in 2009. It was the first time in tournament history that Stanford wasn’t involved in the final after the Cardinal lost to the Trojans in the semifinals on Saturday. But USC wasn’t done after knocking off the No. 4 team in the country, going on to its the first NCAA tournament berth since 2006. Harberts, who came up big in the closing minutes against Stanford, added 12 points and Brianna Barrett had 11 for the Trojans. Deven Hunter led Oregon State (23-10) with 19 points, but the Beavers could not cap their turnaround season with the first conference title of any type in school history. Sydney Wiese added 17 points for Oregon State, which was the first team outside California or Arizona to reach the conference title game. Oregon State could be headed for the NCAAs a season after finishing 12th in the conference. Oregon State has not been to the NCAAs since 1996. "I think this team certainly deserves it. I don’t know why we wouldn’t be in the tournament. I don’t see that argument," Oregon State coach Scott Rueck said. "I’ve looked, of course, and I think this team has earned the right to play in it. But it’s not up to me." USC scored the first nine points of the second half, causing havoc with its press defense. The Beavers committed turnovers on four of their first six possessions to start the half. When they got in their offense, the Beavers missed 11 of 15 shots to start the second half and started 1 of 7 on 3-pointers. Congratulations to the Women of Troy!!! Fantastic basketball tournament. Really proud of team and coaches. Fight On! Alofaituli, Crook and Harberts combined to score the first 13 points of the second half for USC. Harberts’ jumper with 15:50 left gave USC a 42-40 lead it never relinquished. "The press was the difference in the game. I thought we were slow and lethargic and really played Oregon State’s pace in the first half," Cooper said. "I thought we mentally were trying to figure out if we had enough energy to finish this thing out." The Beavers went nearly nine minutes without a field goal between Wiese’s 3-pointer with 11:53 remaining and Hunter’s driving layup with 3:03 left. By the time Hunter scored, the deficit was too much to overcome. Oregon State got within five, but Harberts scored with 1:17 left with one on the shot clock and the Trojans hit free throws to hold on. "It’s an amazing feeling knowing that all of our offseason hard work really paid off," Crook said.